Metal Blade Records sign Lazarus A.D.
Metal Blade Records has signed Kenosha, WI-based Lazarus A.D.
We are extremely stoked about being a part of the Metal Blade family. It is a great home for us, and we know together we are going to accomplish everything we have set out to do and so much more. When the record is released, I don’t think we are gonna see home much, we plan to tour for pretty much the rest of our natural lives! Young Widows have posted two songs from their upcoming full length Old Wounds, due September 9th on Temporary Residence. As previously reported, the album was recorded over four live shows and nine days at God City studios with Kurt Ballou (Converge). You can check out “Old Skin” and “The Heat Is Here” at MySpace. The Louisville, KY band released Settle Down City in 2006 via Jade Tree. Rise Against has posted the cover art for their upcoming record Appeal To Reason. The record, due out October 7th, follows up 2006’s The Sufferer & the Witness. The band recorded with Bill Stevenson (Black Flag, Descendents) and Jason Livermore at the Blasting Room in Ft. Collins, CO — the same production team and studio used for The Sufferer & the Witness and Revolutions Per Minute. 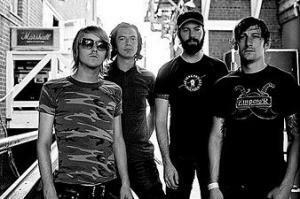 The popular Chicago act also recently released the dates for their tour with Alkaline Trio, Thrice and Gaslight Anthem. Wreck the Place, the webzine formerly known as Punk International, has recently relaunched as a podcast. The audio features will be hosted by Derek Atkinson and site founder Tim Krysko, the man behind Punknews’ International Spotlight series from a few years back. Their first show carries on this tradition and features Fokofpolisiekar (South Africa), Os Contribuintes (Brazil), Zuname (Russia), and more. You can find the first episode here. Spin has detailed These Arms Are Snakes‘ follow up to 2006’s Easter. The new record will be titled Tail Swallower & Dove and is to arrive on October 7th via Suicide Squeeze. The album will feature 10 new songs from the former Jade Tree act. One of the factors that makes this partnership so unique is that the members of Portugal. The Man will share in the risk as well as in the rewards with Equal Vision, something that is easier for a Platinum act (like Radiohead) than a developing artist. Having self-financed the “Censored Colors” album, and while they had other label options, P.TM welcomed the idea of having an “open canvas” with Equal Vision, where they could work at their own pace and be intimately involved in all factors of their recording career. The band previously released the full lengths Waiter: ‘You Vultures!’ (2006) Church Mouth (2007) along with three EPs: 2006’s The Pines, the Devil and Devil Say I, I Say Air and 2007’s It’s Complicated Being a Wizard. Portugal. The Man is currently on the road wit the Rx Bandits and will soon tour Europe. The fall will see a 38 city headlining tour of the US with support from Earl Greyhound and Wintersleep. La Habra, CA’s Zebrahead are now streaming their entire new record Phoenix online at Fuse. The CD / DVD set features 16 new songs and the Broadcast To The World DVD of live footage, and music videos. The release features production work by Cameron Webb and Howard Benson and art by Shawn Harris of The Matches. The set will be released on August 5th by ICON Music Entertainment. The band recently announced US tour dates in support of the record. Jaguar Love, the band made up of Johnny Whitney and Cody Votolato of The Blood Brothers as well as J Clark of Pretty Girls Make Graves, have posted the video for their song “Highways of Gold” on Spinner. The group signed to Matador for their debut album. Simi Valley, CA’s Pulley have posted a blog about their upcoming album, Time Sensative Material. It is their follow up to 2004’s Matters. You can check out the original post here . Gainesville, FL’s Against Me! have released a five-song b-side EP taken from the recording sessions of last year’s New Wave. The album has been made available as a digital download through Amazon’s MP3 download store. Off The Leash is the follow-up to 10,000 Shots which was released in 2005. The East Bay’s Wolves & Thieves and Sacramento’s Bastards of Young, will release a new split LP on August 12. The first batch of 200 will be available on gold vinyl and all purchases will come with a free digital download that includes a special bonus track. Swagger City Records is handling the release and has more details on their website. Both bands will be supporting the release with upcoming tours. Wolves & Thieves will hit the road with Ceremony, and have apperances coming up at The Force’s reunion show and at Tiger Army‘s OCtoberflame 2008. Bastards Of Young will share the stage with Hear The Sirens on a number of dates. San Francisco skate rock act Minus-One will release their first full length CD The Kids Dont Skate Here on DC-Jam Records in Mid September. The trio will begin touring both the US and Europe on Sept 22. Dates and venues will be announced soon via MySpace. Also from Flint, Empty Orchestra is currently on tour across the US performing alongside bands like Lucero, Fiya, Anathallo, and A Static Lullaby. The band is supporting Here Lies Empty Orchestra, which was released last year on Thinker Thought Records. Check their MySpace page for details.